While browsing a number of articles, I started re-reading the old paper by Tekla Dömötör De strigis, quae non sunt... (published in 1975 in Miscellanea Prof. Em. Dr. K. C. Peters). As a Dane, i.e. living in Scandinavia, I can't help being a bit amused when he notes that 'man sich während meiner Auslandreisen, besonders in Skandinavien immer für die ungarischen Vampire interessierte, und meine Antwort, daß nämlich im ungarischen Volksglauben keine Vampire-Gestalt lebe, immer mit der größten Bezweiflung empfangen wurde. In short, while traveling abroad, particularly in Scandinavia, people Professor Dömötör met always showed an interest in the Hungarian vampire, and always questioned Dömötör's claim that there was no such thing in Hungarian folk belief! Dömötör quotes two chapters from Calmet, and notes concerning the Kisiljevo vampire case that the locations are located in (what was back then) modern Yugoslavia. He is, however, unable to locate 'Medreiga', at least there was no haiduk town with a name similar to that, but he provides us with some interesting information on the haiduks. He also mentions that names like 'Arnold Paul', 'Stanoska', 'Jotuitzó', and 'Millo' aren't Hungarian names. Today it is well-known that this vampire case happened in Serbia, but much confusion originates from the references to 'Hungary' and certain other countries and locations in many books on vampires. 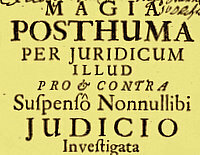 The origin of the phrase "De strigis quae non sunt, nulla questio fiat" is King Coloman of Hungary (11th C.), who prohibited witch trials because "There are no such things as witches - there must be no talk about them." The origin of the phrase is a law promulgated by King Coloman of Hungary ("Ko:nyves Ka'lma'n")in the 11th Century AD who stated that persecuting or trying witches was illegal, because there were no such things as witches. Yes, Dömötör starts the paper by mentioning that King Kalman (Coloman) according to most Hungarian researchers did not mean witches in general (malefici), but only those denoted by the term "strigae".